Manazel Real Estate has launched 860 two and three-bedroom villas in the new Al Reef development. Abu Dhabi-based Manazel Real Estate has announced that the new villas in its Al Reef Development will have sales prices starting from Dhs1.7 million. The company launched 860 two and three-bedroom development in the new Al Reef development, aimed to serve the residential needs of employees of the companies establishing at the Khalifa Port, a statement said. Manazel Real Estate added that it will provide lenient installment schedules for potential investors while easing the transfer process and registration of real estate during the time of resale. The property firm has also received key approvals from Abu Dhabi Urban Planning Council to begin work on the project, Manzel’s chairman Mohammed M. Al Qubaisi said. Abu Dhabi’s residential sales prices have been rebounding strongly, driven by positive investor sentiment and population growth. According to the latest report from property consultant JLL, sales prices for residential units in Abu Dhabi rose six per cent to reach around Dhs160,000 per square metre while rents remained stable at Dhs150,000 per annum. Sales prices of three bedroom-villas alone grew six per cent quarter-on-quarter while registering a 25 per cent rise year-on-year, JLL said. Cashing in on this price growth, developers have launched a number of new residential projects. These include the first residential project within the Saadiyat Cultural District, Mamsha Al Saadiyat, developed by TDIC, comprising nine low-rise residential buildings including apartments and townhouses. Abu Dhabi’s supply pipeline also rose significantly in Q3 this year, analysts say. JLL estimated that around 1,200 units were added to the residential stock during Q3 with the delivery of the B2 building on Reem Island and the Abu Dhabi Plaza Complex on Hamdan Street. 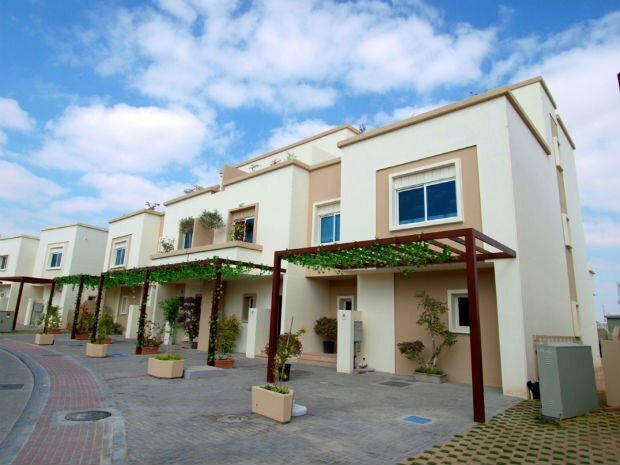 Emirati families have also received new houses within Al Falah scheme this quarter bringing the total residential stock to approximately 242,000 units at the end of Q3 2014.